The Hampta Pass to Chandratal Lake is an amazing 6 days trek covering many picturesque landscapes, right from lush green valleys, pine tree forests, awe-inspiring rivers, rocky mountains, and landslides. The Hampta Pass Trek connects two beautiful valleys, Kullu and Lahaul. These valleys have ever-changing views giving you a different view every time you visit the valley. These variations are enormous scenic landscapes, open green pastures and meadows. The Chandratal lake, meaning ‘Moon Lake’ is believed to be derived from its moon-like shape. During the night, the sky lights up with countless starts and is perfect for some excellent night captures, or just sitting ideal looking at the sky and getting wooed by it. For anyone who is into sky gazing, this is a perfect trek. The first morning of this trek we move towards Jobri, also known as Jobra. With mesmerizing views, the rocky Himalayas, dense forests decorated with a variety of trees like oak, maple, deodar and the alpines, trekking towards Jobri is unexceptional. As we reach Jobri, we have lunch, rest and explore the place. Have the evening at leisure followed by dinner and bonfire amongst the mountains. With this day, comes the most special day of the trek, be ready for the thrilling experience of river crossing while heading towards Balu ka Ghera at 12,000 ft, a small delta. One side of the river crossing will be Rani river and a rectangular valley on the other side, a breath-taking experience indeed. The journey will take us 4 to 5 hours. 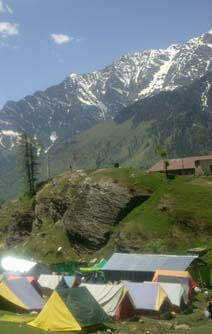 As we reach Balu ka Ghera also known as the bed of sand, you are at the ground level with mountains right behind you. We camp here for the night amongst the mountains. Today, we will traverse to Shea Ghoru by crossing the Hampta Pass and get close to 12,500 ft above sea level. The complete journey from Balu Ka Ghera to Shea Ghoru is 10 hours covering 10 km, a true taxing day. But you won’t feel the troubles as the journey is accompanied by the sheer beauty of the trail going through valleys, climbing rocks watching the river flowing below, and even walking on snow! Shea Goru is known to be the valley of snow, so once we reach here, you can rest in tents while watching the snow surround you by the riverside. Our destination for the day will be Chandratal Lake, also known as Lake of the Moon, which is 70 km away from Chatru and takes 3 hours via vehicle. 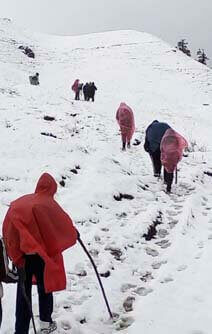 We begin the day with trekking to Chatru. 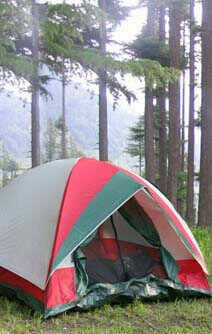 On reaching Chatru, we have lunch, camp here and take a jeep ride to Chandratal Lake. The evening will be perfect as we enjoy the sunset and experience the onset of the night. 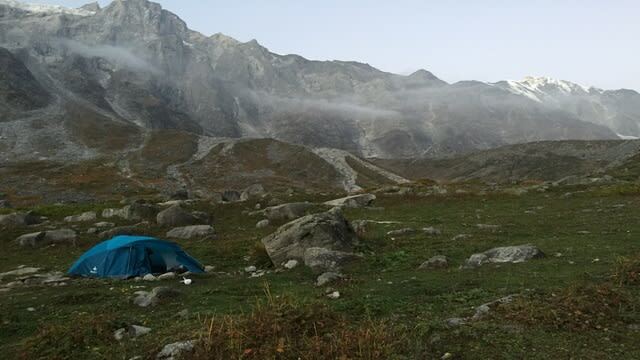 After enjoying the lake site view entirely, resting there for a while, you will be back to Chatru, to your tents, and will stay there overnight. On the last day, we trek back to Base Camp. 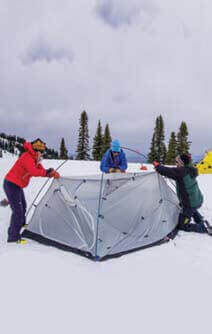 On reaching the base camp, rest of the day can be utilized to either go for local sightseeing, you can choose to go for adventure sports or rest in base camp. A private drop to Patlikuhal will be provided, we can also assist you with the bus timings from Patlikuhal.